Wärtsilä actively handles its relations with stakeholders by engaging with them in an open and constructive dialogue. Wärtsilä considers this approach as an essential element when developing its operations, products, and services. 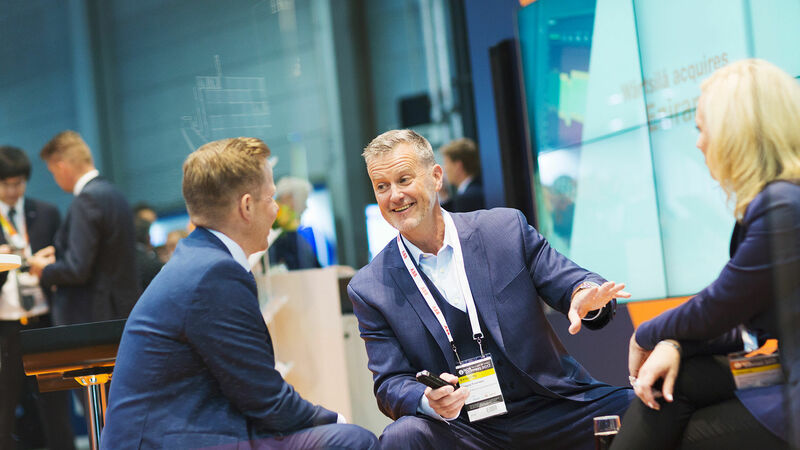 At the corporate level, Wärtsilä has defined its most important stakeholders as being its customers, owners, suppliers, employees, and society in general. Wärtsilä's subsidiaries define their own primary stakeholders, which in addition to the ones mentioned above, include local residents close to production plants, educational institutes, and public authorities. Wärtsilä’s Code of Conduct provides the foundation for the management of stakeholder relations, while the priorities involved vary within Wärtsilä from one subsidiary to another. In order to facilitate active dialogue with its customers, Wärtsilä arranges Customer Days for existing and potential customers at locations in various parts of the world. During these events, subjects of topical interest from both local and global perspectives are reviewed, and existing and future needs and challenges are discussed. In addition to these Customer Days, the Marine Solutions and Energy Solutions businesses arranged or participated in over 300 industry-related events globally during 2017, including international and national seminars, exhibitions, and conferences. These events were attended by customers, potential customers, and other stakeholders, such as investors, consultants, suppliers, students, and other interested parties. Long-term research programmes are an important means of enhancing open dialogue and co-operation with key industry players and important research institutions. Wärtsilä has actively initiated and participated in the development and work of common research programmes, both locally and internationally. Dialogue with employees takes place in many formats. More information about the procedures and processes to support active and engaging dialogue with Wärtsilä employees is described in the section covering Consultation and information procedures in Group companies. Wärtsilä also engages in an active and open dialogue with local and international public authorities and officials. The aim is to share information, provide expertise and support authorities in improving the quality of regulatory matters. Wärtsilä participates in public consultations in areas that are of importance to the company. Wärtsilä signed the United Nations Global Compact initiative in 2009 and supports its ten principles with respect to human rights, labour, the environment, and anti-corruption. Wärtsilä is committed to aligning its strategy, culture, and day-to-day operations with the principles, and to engage in collaborative projects that advance sustainable development. Wärtsilä's Code of Conduct and sustainability programmes are the practical tools used for promoting the principles within its sphere of influence. In 2011, Wärtsilä joined the Sustainable Shipping Initiative (SSI) and signed its Vision for a Sustainable Shipping Industry in 2040. The initiative brings together some of the biggest companies in the maritime sector. Wärtsilä also participates in the Sustainable Marine Biofuel Initiative, the purpose of which is to accelerate the development of reliable combustion engines capable of running on sustainable, scalable, and affordable marine bio-fuels. Wärtsilä has signed the Finnish Business and Society's (FIBS) Diversity Charter, and has also signed an agreement in 2016, whereby Finnish industry voluntarily endeavours to use energy more efficiently. Wärtsilä North America Inc. signed the Customs Trade Partnership Against Terrorism (C-TPAT) agreement in 2003. In 2017, Wärtsilä participated in activities organised by various national and international organisations and associations. The key organisations for Wärtsilä and the nature of Wärtsilä's involvement in the organisations are presented in the table below. Interest groups Confederation of Finnish Industries (EK), Federation of Finnish Technology Industries, Finland Chamber of Commerce, International Chamber of Commerce (ICC), ICC Finland Membership and participation in activities. Industrial organisations Association of Singapore Marine Industries (ASMI), Brazilian Institute of Oil and Gas (IBP), Brazilian Thermoelectric Generators Association (ABRAGET), Cogen Europe, Confederation of Indian Industry (CII), Cruise Line International Association (CLIA), BIMCO, EnergyVaasa, Engine Manufacturers Association (EMA), European Association of Engine Manufacturers (Euromot), European Engine Power Plants Association (EUGINE), Exhaust Gas Cleaning System Association (EGCSA), Hong Kong Shipowners Association, Indian Diesel Engine Manufacturers Association (IDEMA), Interferry, International Council on Combustion Engines (CIMAC), Society for Gas as a Marine Fuel (SGMF), Union of the Electricity Industry (EURELECTRIC), Verband Deutscher Maschinen- und Anlagenbau (VDMA), WaterBorne TP, SolarPower Europe Board membership and participation in activities of specific working groups (CII, CIMAC, Cogen Europe, EMA, Euromot, EUGINE, VDMA, WaterBorne TP). Membership and participation in activities (ABRAGET, ASMI, BIMCO, CLIA, EGCSA, EURELECTRIC, EnergyVaasa, Hong Kong Shipowners Association, IBP, IDEMA, Interferry, SGMF, SolarPower Europe). Standardisation organisations European Committee for Standardisation (CEN), International Organisation for Standardisation (ISO) Participation in activities. International organisations European Sustainable Shipping Forum (ESSF), International Maritime Organisation (IMO), Global Compact Nordic Network (GCNN), Global Industry Alliance (GIA) Participation in activities through national delegations (IMO). Participation in activities (ESSF, GCNN, GIA). Other Cleantech Finland, Finnish Business & Society (FIBS), European Energy Forum (EEF), Global Reporting Initiative (GRI), Sustainable Shipping Initiative (SSI) Participation in activities.